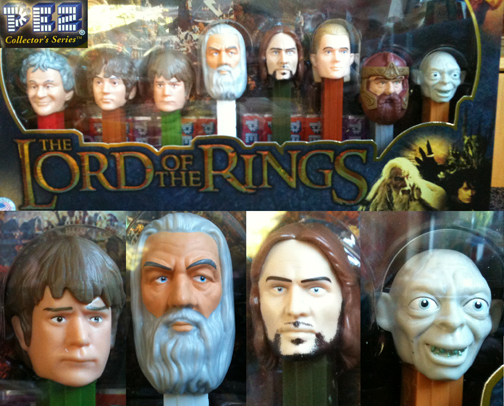 So, I was in the store this morning, buying lollipops to stick in the head of a baby doll, when I came across the Lord of the Rings Limited Edition Collector's Series Pez set! And I thought, "Wow. I need to have that for a number of reasons." The first thing is that the Pez dispenser figures are different heights. They could have made all of these Pez dispensers the same height, but they didn't. They made the hobbits, the dwarf and Gollum short. That is what I call attention to detail. The second thing is that Gandalf won't meet your eyes. Each of the other seven Pez characters is looking right at you, bold as brass, but not Gandalf. He's kind of scowling and looking off to his left, as if he's lost in thought or perhaps slightly embarrassed to be a Pez dispenser. The third thing is that only Biblo and Gollum are smiling. You know what that is? That's symbolic. Bilbo started the whole thing, and Gollum finished it, so really, these are the two guys who are responsible for everyone else becoming Pez dispensers! And apparently, they're really enjoying it. Especially Gollum. If I didn't know anything about the story, I'd think he was a happy character and possibly a comic relief element. Maybe he's just thrilled that a completely CG character got his own Pez dispenser. Maybe that's it. Fourth, Samwise Gamgee looks like he's going to puke and Frodo Baggins looks kind of like a young John Lennon. And sixth, it's Lord of the Rings done in Pez. It makes me want to shoot my own stop-motion, 13 hour version of the trilogy, completely recreated with Pez dispensers. Or, at least maybe a recreation of one of the trailers. A short one. It's just come up way too many times in a coincidental way in the last few weeks. First, there's the whole Lev Grossman The Magician King connection. If you haven't read the Magician King, it's the excellent sequel to The Magicians. The series is sort of like Chronicles of Narnia meets Harry Potter meets Buffy the Vampire Slayer with a little John Dies at the End sensibility. Really enjoyed the new one. Then, of course, there's the Axe Cop tie in. Axe Cop goes to Narnia and battles the White Witch. If you haven't read Axe Cop, you are really missing something good. Axe Cop is written by 5-year-old Malachai Nicolle and illustrated by his 29-year-old brother Ethan Nicolle. And it's awesome. Kind of like a cop with an axe meets a 5-year-old's outlook on life. Anyway, both The Magician King and Axe Cop have got Narnia on my mind. Well, they got Narnia on my mind in a different way than it already was. See, I've been reading all of the Narnia books to my five-year-old for the last several months, so Narnia was already on my mind. But The Magician King and Axe Cop messed with that. And then, last night, my daughter and I finished The Last Battle. I don't know when the last time was that you read The Last Battle, but there's a lot of weird and intense metaphoric stuff going on in there that makes you just think, "hmmmmmm". So, I expect something Narnian is going to happen any minute now. I hope Aslan doesn't claw me for writing The Helm. He's not a tame lion, you know. Anyway, let me know if anything Narnian happens to you over the next few days. Sometimes I google The Helm to see if anyone is posting anything interesting about it. Yes, that's kind of self-infatuated behavior, but I never said I wasn't self-infatuated. And if I don't google it, I don't think anyone else will. The Helm's not going to just google itself, you know. Anyway, today I got a link to a college syllabus that features The Helm as required reading! Required Reading!! Whoo Hoooo! People are being forced to read The Helm!!! For college!!! The class is called Literature for Young Adults: Postmodern Adolescence and it's worth 3 credit hours. The Helm is on the same list as books by Neil Gaimen (Death, the High Cost of Living) and Suzanne Collins (The Hunger Games), which is pretty cool. At least, it's pretty cool for me. I don't know how Neil and Suzanne feel about it. Okay, so there's also a book by Stephenie Meyer (Breaking Dawn) on the list. I haven't actually read any of the Twilight books, but I have seen the movies and I like two of them. Stephenie Meyer, I know you read this blog religiously and I'm sorry if I've surprised you by revealing on such a public forum, read by millions, that I didn't like one of your Twilight movies and that I haven't read your books. I have simply been too busy googling The Helm and The Creature from Lake Michigan and my various other wildly successful intellectual properties to get to them. I will strive to do better in the future.